It proved to be an experience that led to seeing a side of China familiar to me and a side I had not yet seen. Like the student I had earlier met elsewhere in Changsha, she was handing out printed advertisements for a part time job. Unlike the other student, she was not earning 40 yuan RMB for working four hours. Instead, she was earning 30 yuan RMB (approximately US $4.80) for the same amount of work. However, if she chose to work a full day she could earn 50 yuan RMB--the same as offered to the other student. 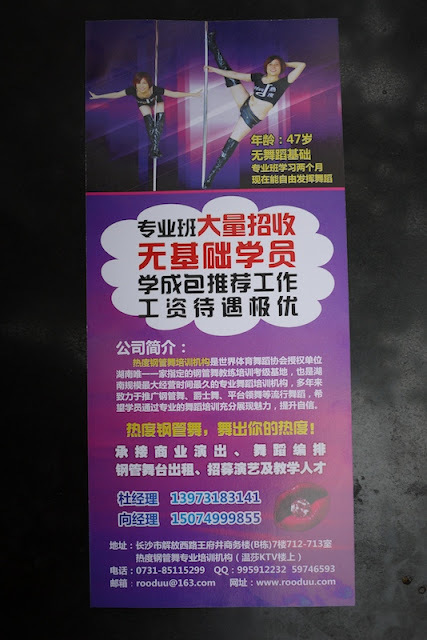 Yes, Changsha has at least one pole dancing school, and it was seeking new students. Given the many clubs in Changsha and what I have seen at some clubs elsewhere in China, this made perfect sense to me. However, I had never seen a pole dancing school before. On a later day, I met another student handing out the same printed advertisement. After I asked her a few questions about the school, she offered to bring me there. So we went up to the 7th floor of a large building which also includes several clubs. Not surprisingly, inside the school next to the lobby was a dance room full of poles and pole dancing students. While there, I had a pleasant conversation with a manager, and he proudly told me about one of their graduates who now dances in the UK. If you're curious to learn more about this school, their website (in Chinese) can be found here. It includes a variety of photos and a video which can also be watched on Youku here (probably will begin with an unrelated ad). In case you are concerned, I would consider it all safe for work (the video is similar to what is displayed above but with movement). As they say on their website, the school believes it is about being "专业 Professional", "健康 Healthy", and "自信 Confident". I will refrain from explicitly making any deeper points--just sharing more of what I have seen in a country that has surprised me in a variety of ways, including in how it is both different and similar to a country such as the U.S.
*Updated link from currently dead www.rooduu.com to currently working www.rooduu.cc on May 31, 2015.